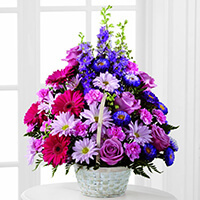 Provide comfort for the family of Mrs. Gweneth Betts with a meaningful gesture of sympathy. 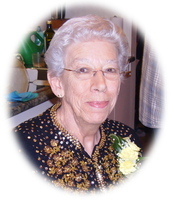 Mrs. Gweneth Louise Betts, age 87 years, passed away peacefully in St. Joseph's Hospital on Sunday, April 7, 2019. Gwen was born into a farming family of nine siblings in Kingsbury, Quebec on November 29, 1931. Drawing from her upbringing she made her family her career and created a loving and nurturing household. She took great pride in her home and her gardens. Her door was always open and the tea and cookies readily available. You were made to feel welcome and part of the family. Always willing to lend a hand or unbiased ear, Gwen put the needs of others ahead of her own, expecting nothing in return. She will be sorely missed. Gwen was predeceased by her husband of 43 years Victor. She is survived by her sons: Randy, Ryan (Susan), Regan (Glynis) and grandchildren Marissa, Courtland (Casia), Dalton (Victoria), Shanna (Brad), and Dylan as well as numerous nieces and nephews. Funeral Services for the late Mrs. Gweneth Betts will be held on Friday, April 12, 2019 at 1:00pm in the WESTFORT CHAPEL, 420 West Gore Street at James, officiated by Rev. Neil Otke. Private interment will follow in Riverside Cemetery. Should friends so desire, donations made in memory of Gwen to the Heart and Stroke Foundation would be greatly appreciated. To plant a memorial tree in honor of Mrs. Gweneth Louise "Gwen" Betts (Fowler), please visit our Heartfelt Sympathies Store. We encourage you to share your most beloved memories of Mrs. Gweneth here, so that the family and other loved ones can always see it. You can upload cherished photographs, or share your favorite stories, and can even comment on those shared by others. I'm sorry to lose such a special friend. I'm keeping you all in my thoughts and prayers. Sincere Condoleances to you all. Myrna Doyle Molene (daughter of late Edwin, brother to your late Grandmother Hazel. Victoria, B.C. Thinking of you and your family, keeping you in our thoughts. Denise, Chris, Heather, Aman, Jude purchased the The FTD Pastel Peace Basket for the family of Mrs. Gweneth Betts.